Ok guys so today I am going to answer one of the most frequently asked questions I get from students of my online training course as well as visitors to my blog. First let me be clear and let you know I do not do job placement. Sorry but I am not an employment agency. I teach people how to become freight brokers or freight agents in 30 days or less. If you want to get hired as a freight agent follow the steps in this article and you will find success! 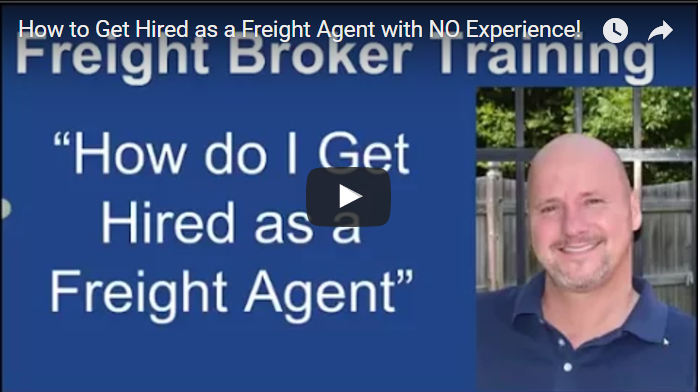 So here are a 5 steps you need to take to get hired as a freight agent without experience or a customer base. 1. Get trained by someone that has done what you are looking to do! Training can come in many forms. You can also get hired as an entry level employee at a local freight brokerage. First you gain valuable knowledge from an expert that has already done what you are looking to do. Secondly it builds your confidence to get started on your journey. Last but not least it shows potential freight brokers that might be interested in hiring you that you are willing to invest your time and money and that you are very serious about your career as a freight agent! This list should start in your local area, preferably within driving distance but do not limit yourself to just local brokers. You should also try to focus on smaller companies because they are the most likely companies to give a new broker/agent with no experience or customer base the opportunity to become an freight agent. Do not focus on large companies like CH Robinson, Total Quality Logistics, XPO Logistics, Coyote Logistics or any other large brokerage as they will rarely hire inexperienced freight agents. On the other hand if you are sharp and are open to an entry level w2 type job to gain some great experience as these companies are regularly hiring. Here are some resources to search for freight brokers. Search Loadboards like www.Internettruckstop.com, www.Getloaded.com, etc. When creating your profile make sure to highlight your qualifications, experience and any and all training you have taken to qualify you for the position. Relevant training includes: sales, marketing, negotiation, customer service, Microsoft Office, leadership, management, social media, public speaking, call center training, etc. Most of all use your profile to position you as someone that has a positive attitude, works hard and is willing to prove his/her value to a potential freight broker partner. CLICK HERE for my Free book that will help you get started on LinkedIn!!!! 4. Make contact with your potential Freight Broker partners! Making contact can come in many forms. You can search for and connect with people that work for your target company on LinkedIn. This will get you on their radar and then after connecting just message them and ask ” what is the best way to get started as a freight broker or freight agent for your company?” The objective to develop some rapport and relationship so you can convert that conversation offline into a phone call or face to face meeting. You can ask people you know for referrals into companies that could make good potential freight broker partners. Have them do an email or phone intro to you. You can cold email or call the sales manager and inquire if they have a freight agent program and what are the qualification. 5. Ask for an Opportunity! Setup a call or face to face meeting with your connection and explain the fact that you are looking for an opportunity to become a broker/agent for their company. Then explain WHY this is your goal/dream and that you have been researching the indusry and have even taken some courses. Let them know that you are willing to prove yourself by working on straight commission and will only get paid if you bring NEW customers to their company! The fact is, not everyone is going to say yes but I am confident that if you do this with 10-20 smaller/newer freight brokers you will get an opportunity. Please note, it is very important that you share your story on WHY you want to be a freight agent and that you are willing to prove yourself at NO RISK to them and if you do this passion and conviction you will get hired as a freight agent! If you follow my plan above and for some reason you do not get hired use LinkedIn, Google or a load board to find 10 experienced “Freight Agents” who are already established with a reputable freight broker and ask them to become what is known as a sub agent. A sub-agent is simply an agent of an existing agent. So while you may not get a full 50% commission on your work you should be able to get some great experience and mentoring as you gather your first customers. Once you get a small customer base you will be able to transition to your own agency in the future, if you choose! Did this article help you out? If so, I would greatly appreciate it if you would comment below, SHARE on Facebook, Twitter, LinkedIn and be sure to click the g+1 logo and let Google know too! P.S. Ask yourself a question…Why haven’t you started your Freight Brokerage or Freight Agency yet? 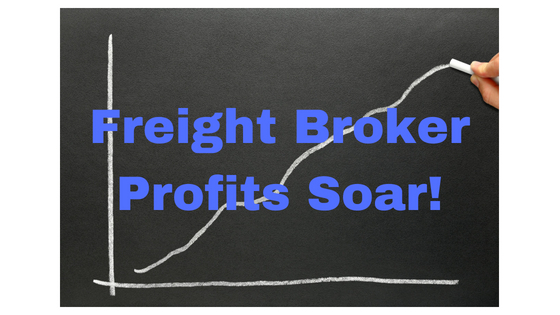 Get started in under 30 days with my online Freight Broker Boot Camp! 4 Comments on "How Do I Get Hired as a Freight Agent!" I am a retired accountant who’s looking to start a new career as a freight broker. I’m at a loss as to what to do in order to get the training needed in order to become a licensed agent. I need your assistance and will take advantage of any data you have available on your website. I’m excited to learn from your experience and appreciate you sharing your knowledge. To get enrolled in my online training go to http://www.freightbrokerbootcamp.com Hope this helps you on your journey as knowledge is the key to getting started!